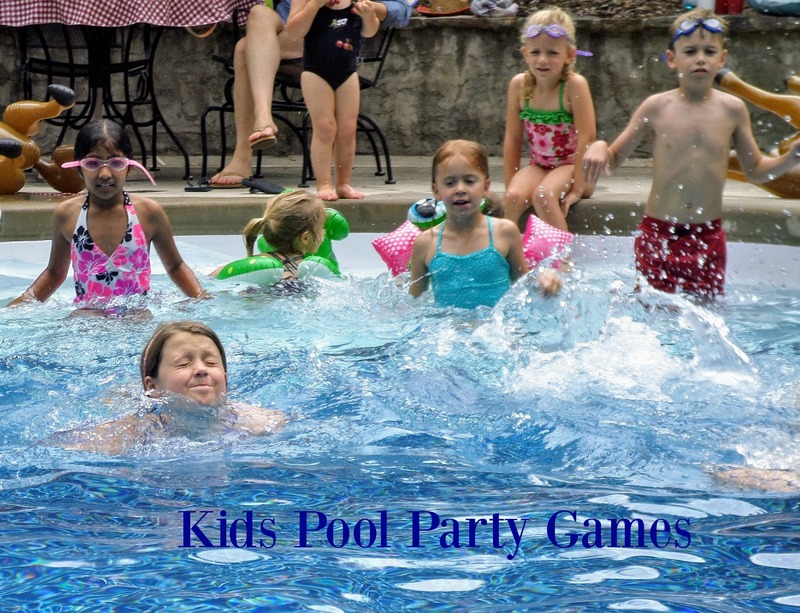 Pool games for kids can be simple diving games, water balloons or relays ... or they can be theme based like pirate party games or a mermaid or Finding Nemo game. They need to age appropriate and geared toward their swimming ability. Make sure the games always have adult supervision. Some games don't require any swimming, just the willingness to get into the pool and get wet. Our pool has a large shallow end which is great for playing pool volleyball, basketball and badminton or just plain catch. Enjoy basketball? Enjoy it even more with this floating hoop. You don't need to come up with ideas for pool games with this one - just let the kids play. Be prepared for to play pool party games with this inflatable pool basketball toy. Let it float and let the kids toss the included pool basketball into the hoop. Play with points - get designated points depending on which opening your basketball leaves the hoop. 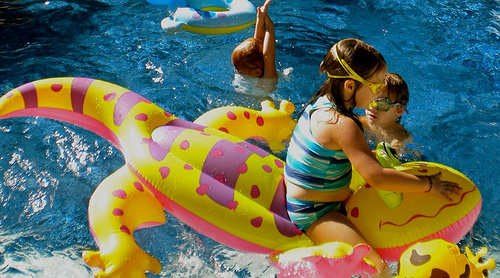 From inflatable dolphins to inflatable cars and horses, your imagination can come up with lots of creative swimming pool games. Use the inflatables for races or free time in the pool. 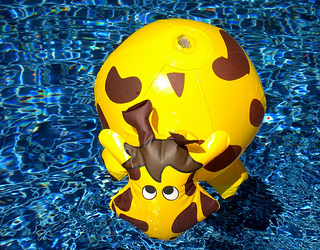 Themed beach balls from jungle animal beach balls like the one pictured to frog beach balls are enjoyed by all ages. These themed toys turn ordinary beach balls into something more exciting and appealing. Have them floating in the pool when your guests arrive as pool party decorations. Use them for simple races holding onto the beach ball, toss games, and for free time in the pool. And when the party ends let the kids take them home as pool party favors. 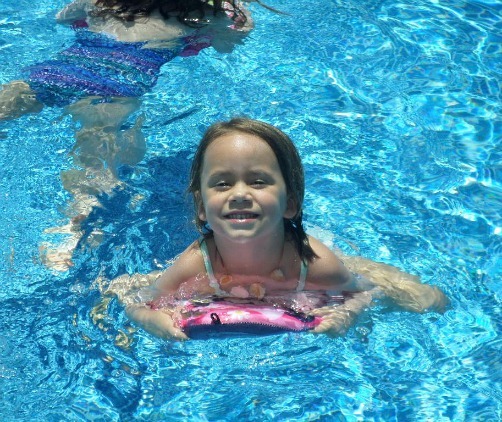 There is a different enthusiasm for swim rings that are well, like the beach ball, have a theme - whether it's Disney's Frozen Elsa and Anna Swim Ring, pirate themed or fun shapes like monkeys, hippos or frogs - kids gravitate to them instantly and are soon racing across the pool. This one pictured is a Little Mermaid swim ring. Check for them at your local dollar store or our Kroger grocery store carries a nice assortment in the summer. Use them for fun races. Get two different swim rings - one for each team. For older kids who think they are too big for swim rings - get one that splits so it fits around them. You are never too old to be silly. Swimming pool diving games can be a fun way to keep cool and everyone in the pool. 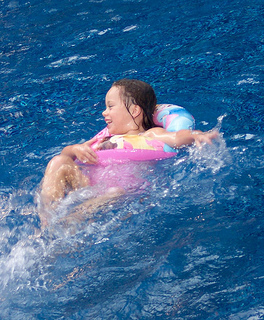 Be sure to find out how well the kids swim and always have adult supervision. Almost all of our pool parties include some kind of dive toy or game. These swim through hoops provide lots of opportunity for fun games. 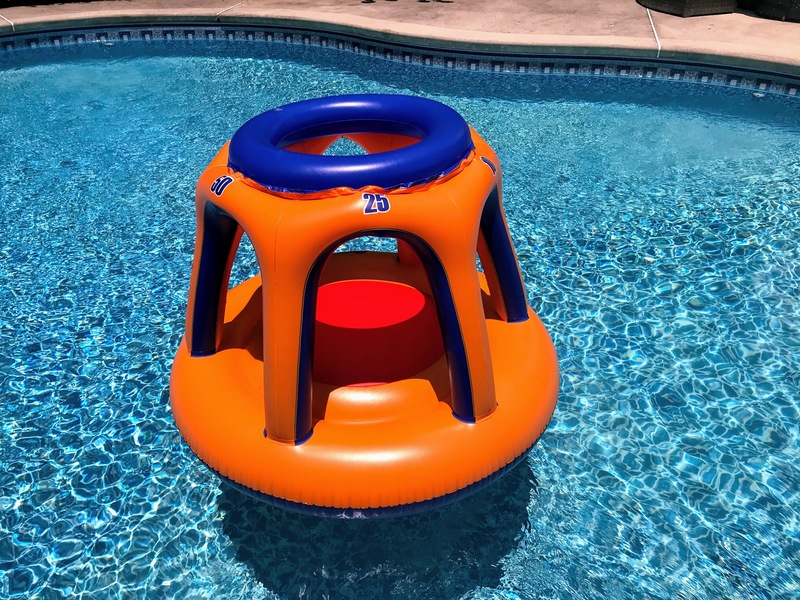 They can sit on the bottom of the pool or you can adjust these hoops so that they are floating just under the surface of the water. Set them a couple of feet apart. Princess Dive Characters , find dive toys that appeal to the age, gender and interest of your children. 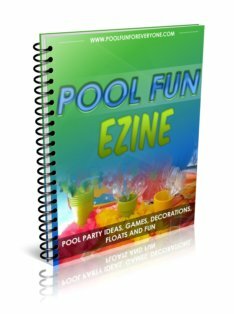 Make your dive games fit the theme of your party, such as diving for "buried treasure" for your pirate party game or finding friendly seahorses for your mermaid party. Whether your kids like Minnie Mouse or Spider-Man there is a swimboard that appeals to all ages and genders. Simply divide the kids into two teams. Give each one a kickboard. Each team member swims to one end of the pool and back and hands the kickboard to the next team player. You can often find these pool toys in the beginning of the pool season at Target, the Dollar Store or K-Mart for a better price than Amazon. Move your baseball game from the field to the pool. A foam bat and ball makes for a great swimming pool game for boys and girls. Lots of leaping and splashing are needed to catch the fly ball. For each ball that is caught award a point. The swimmer with the most points wins. Play a real game of baseball in the pool. Mark off spots around the pool to swim your bases. 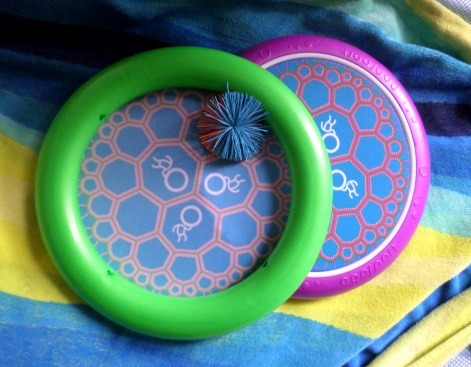 Two large 12" bouncy discs with an Ogo soft ball provides lots of fun game time in the pool. 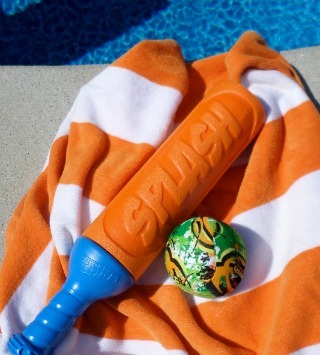 Easy to volley back and forth, kids of all ages will enjoy this addition to your pool toys. Kids can create their own fun and games with splash bombs. This is a set of 4 from Amazon - you can buy larger packs of 12 or 24 - but I found that those balls were much smaller. This set is a full 3" about the size of baseballs. Place two hula hoops on the opposite ends of the pool and divide the kids into two teams. Each team tries to get their splash bombs into the other teams hula hoop. No one is allowed to touch or move the hula hoop - but they can try to catch or block any toss. 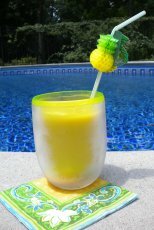 Another fun way to use the splash bombs is with these fabric covered paddles. Just volley the ball back and forth. 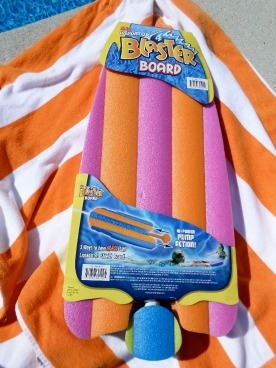 The large paddles make it easier for younger kids to play, but older kids love playing with it as well. Get two sets to include more players. Get extra splash bombs on line or at your local dollar store. Our kids love leaping for the splash bombs. See how many volleys can be made before the ball falls into the water. This game has kept our kids entertained for hours. Who doesn't enjoy a game of football? It's even more fun in the pool. Get dads playing with their kids with this pool toy. Toss it, jump for it and dive in for the big catch. Divide into two teams. Each team gets one water blaster and one beach ball. The first team members place the beach ball right in front of them and use the water blaster to get the beach ball to the other side and back. The next team member repeats the activity. Team that finishes first wins. Defend or attack with this Max Liquidator - shoots water up to 30' and the board can be used to protect you from friendly fire from your "enemy." Ride on it like a swim board, shoot water or hold it up like a shield. Be sure to get two of them for lots of pool fun. 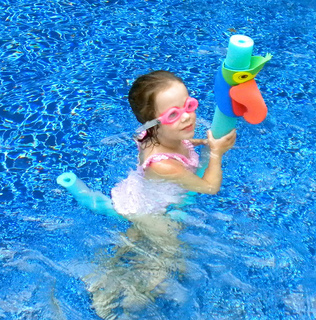 Use the water blaster to blast beach balls across the pool for one game idea. 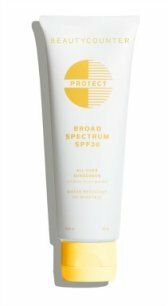 I found mine at Target in the summer for around $14 and at Amazon they are much more. 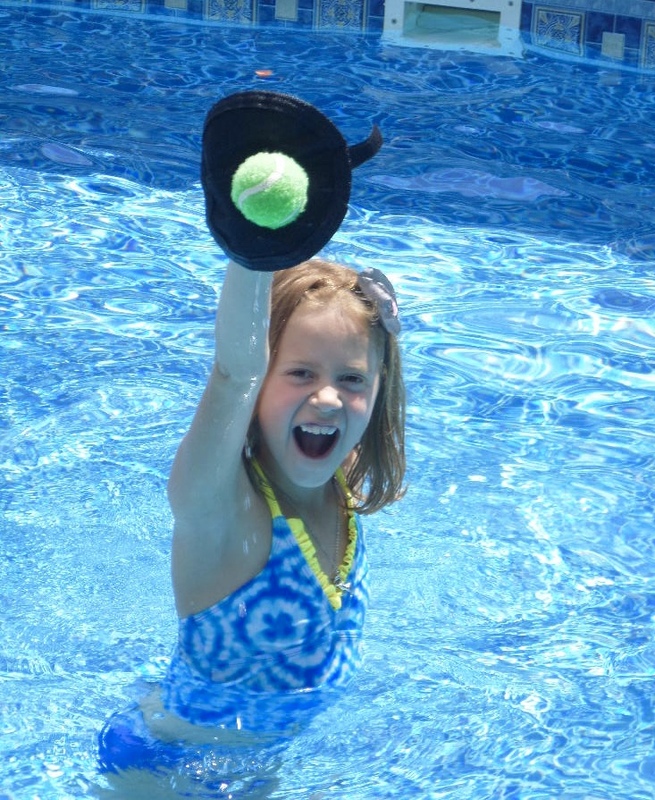 Kids love playing catch in the pool and there's no easier way than with a velcro ball and mitt set. Transform swimming pool noodles into parrots, monkeys or lions. Buy your foam noodles for just a dollar a piece at your local dollar store. Get a couple of animal foam visors and wrap them around the foam noodles. Now the monkeys get to race the lions across the pool or the sharks can chase the dolphins. 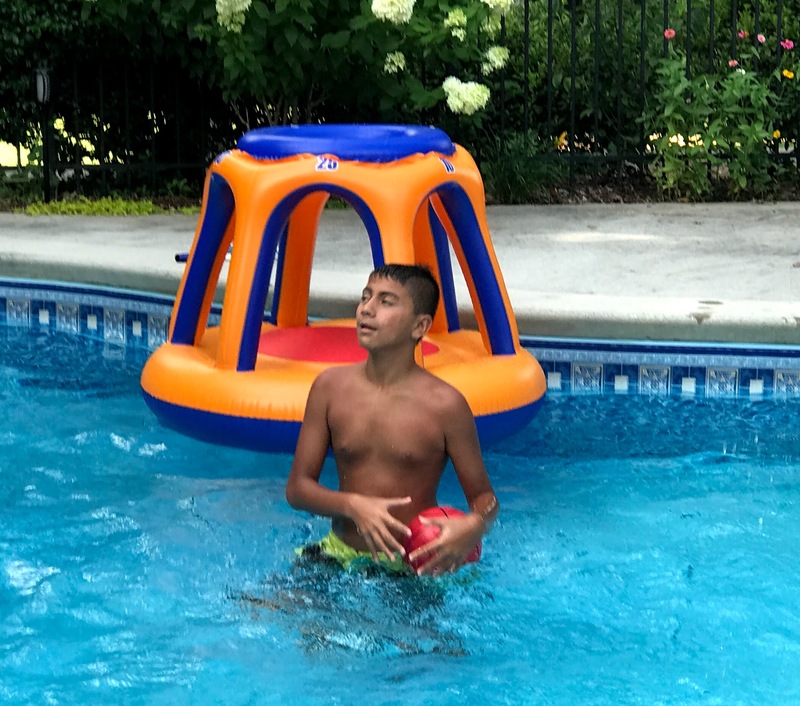 With a little childlike creativity, a sunny day and a few pool toys you can have some fun with these pool games for kids.